Michael Jon Mortimer, Sr, son of Raymond Mortimer. 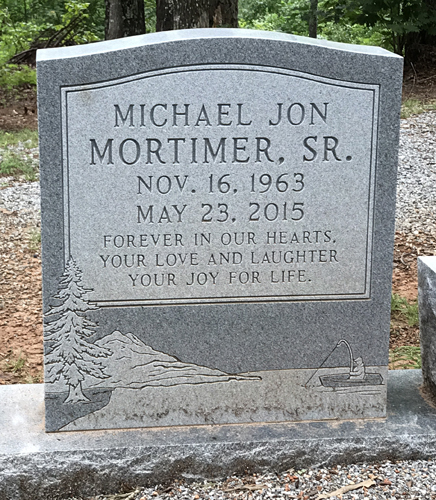 Michael Jon Mortimer, Sr., age 51, of Canton, GA and formerly of Chilton, WI passed away Saturday, May 23, 2015 at Northside Hospital Cherokee. Funeral services are scheduled for 2:00 PM, on Wednesday, May 27, from the Chapel of South Canton Funeral Home with Rev. Thomas Jennings officiating. Interment will follow at Old Macedonia Cemetery. The family will receive friends from 6:00 PM to 9:00 PM, Tuesday, and from 10:00 AM to 2:00 PM, Wednesday, at South Canton Funeral Home.